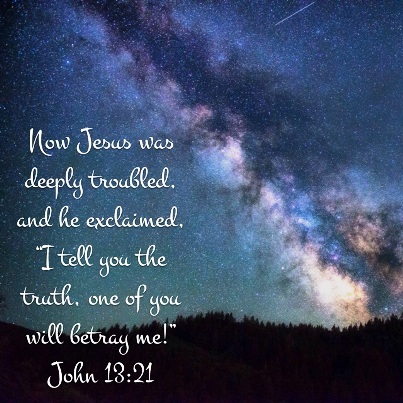 21 Now Jesus was deeply troubled, and he exclaimed, “I tell you the truth, one of you will betray me!” 22 The disciples looked at each other, wondering whom he could mean. 23 The disciple Jesus loved was sitting next to Jesus at the table.24 Simon Peter motioned to him to ask, “Who’s he talking about?” 25 So that disciple leaned over to Jesus and asked, “Lord, who is it?” 26 Jesus responded, “It is the one to whom I give the bread I dip in the bowl.” And when he had dipped it, he gave it to Judas, son of Simon Iscariot. 27 When Judas had eaten the bread, Satan entered into him. Then Jesus told him, “Hurry and do what you’re going to do.” 28 None of the others at the table knew what Jesus meant. 29 Since Judas was their treasurer, some thought Jesus was telling him to go and pay for the food or to give some money to the poor. 30 So Judas left at once, going out into the night. 31 As soon as Judas left the room, Jesus said, “The time has come for the Son of Man to enter into his glory, and God will be glorified because of him. 32 And since God receives glory because of the Son, he will give his own glory to the Son, and he will do so at once. The phrase “hindsight is 20/20” means that, when an event happens, we look back and see all the evidence lining up such that we should have foreseen what was about to happen. In our passage from John today, Jesus directly laid out what was about to happen, and yet it was a mystery to those closest to him. Although Jesus directly told the disciples that Judas would betray him, all the disciples were shocked and dismayed when Jesus was suddenly taken away from the garden of Gethsemane to be tried. I try to imagine what the disciples must have felt that night. They must have asked how things could have been different. They must have said to one another that, if only they had paid attention to Jesus’ words, they could have found a place in the countryside to hide. Or, if Jesus was determined to die, at least they could have stayed awake and comforted him. I imagine some of them wept lamenting that they could not even stay awake one hour. In our lives, times like these come and go. We pass up opportunities that should have been no-brainers, or we make grave mistakes that we were warned about well ahead of time. When it is revealed to us how badly we screwed up, we can suddenly feel stupid or unworthy of peace. We tell ourselves that we made our own bed; we should lie in it. After Jesus’ death, the disciples also believed that the story was over. They accepted their fate of living in guilt and went back to fishing, but Jesus had other plans. The gospels tell us that Jesus went to the disciples and gave them the responsibility of going out into the world and making disciples of all nations. In the end, the disciples were not only forgiven but charged with more responsibility. Jesus showed the disciples that the crucifixion and resurrection had to happen and that their mistakes were not to define them or their capabilities. Hindsight may be 20/20, but part of God’s saving work is freeing us from the despair and shame of hindsight. May the grace of Christ comfort us in our mistakes, and may the fellowship of the Holy Spirit guide and restore us on our life journeys. AMEN.